Low Carb Rotisserie Chicken Recipes | 3 Easy Ways! Rotisserie chickens have saved me time and effort many a nights and I'm fully grateful for their existence. That being said, it can get boring eating them whole every time, so we created three Low-Carb Rotisserie Chicken Recipes that will take you under 10 minutes to make and under five minutes to devour! When you buy the whole chicken, you get dark meat, white meat, fatty skin and meat right off the bone, so it's extremely tender and high in fat. Many are lightly seasoned, but all make for a great, quick dinner fix. What's Your Favorite Keto Add-In? When it comes to hitting my macros and also wanting delicious foods, add-ins are a must, in my opinion. Options will seem unlimited. Some of our favorites we think would work in all the recipes in this post as well as in a lot of your others meals are as follows. "Don't be scared of a little flavor or crunch," is something I always say to Matt. He's a simple guy with simple needs, but when it comes to food, being extra will only make your life better. Having add-ins readily available in the fridge or pantry for quick use makes sticking to keto a lot easier. I can get bored of eating the same thing, but throw in some seasonings or veggies for crunch and it feels like a completely different meal. Dextrose or sugar - This is usually low on list of ingredients meaning it's minimal and we wouldn't worry too much about it! Modified food starch - This will also have minimal impact if any at all so don't worry about this. You aren't likely to see an artificial coloring or flavors, which is a good sign. You may even find a rotisserie chicken with no added sugar or dextrose. We've seen them in Kroger! You could easily sub out any of the ingredients listed below to make your own fun variation on these three easy chicken recipes. I think the biggest takeaway is that using an entire rotisserie chicken can be fun and transformed into completely new recipes you wouldn't expect. Either way you make it you can't go wrong with these Low-Carb Rotisserie Chicken recipes! 1. "KetoConnect - Rotisserie Chicken Salad"
​2. 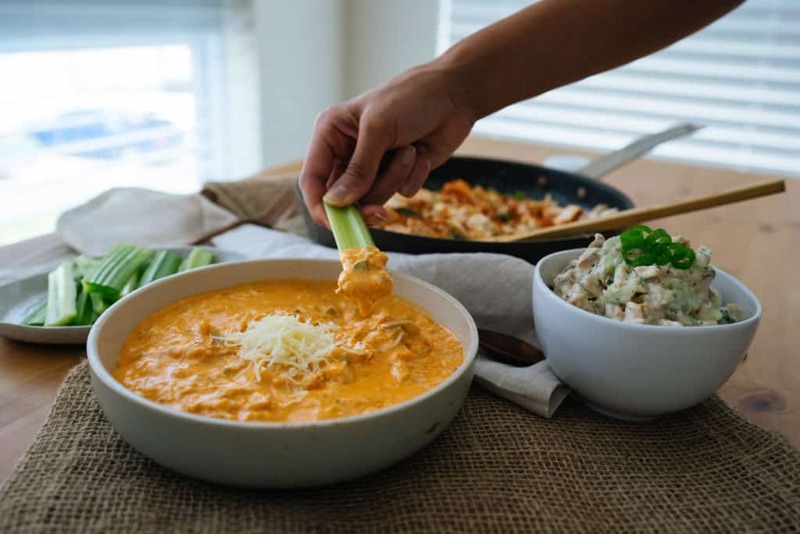 "KetoConnect - Rotisserie Buffalo Chicken Dip"
3. 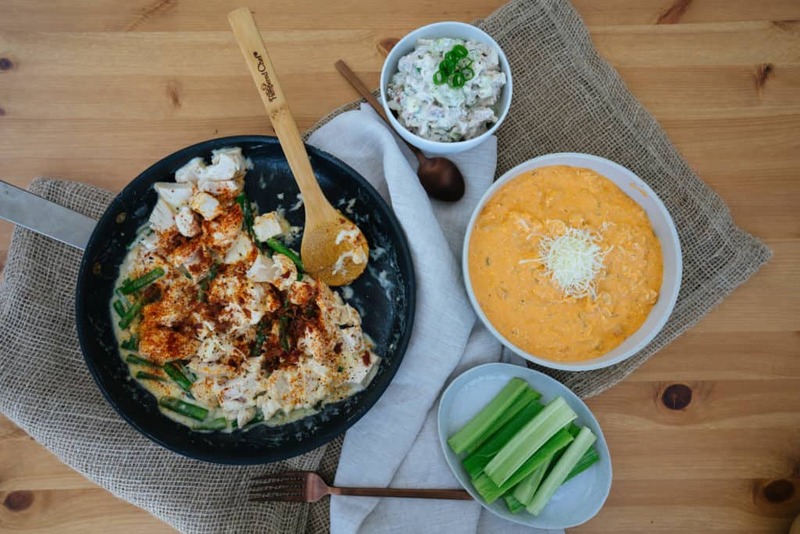 "KetoConnect - Rotisserie Chicken Alfredo"
Combine the sour cream and may in a large bowl. Chop the chicken up into large or small chunks and add to the mayo mixture. Chop up the celery, green onion and mince the fresh dill and add to the bowl. Add in the bacon bits and heavily season with salt and pepper. Chop the chicken up into small chunks and dice the jalapeno and set aside. Heat a bottom heavy sauce pan to medium heat and add int he cream cheese, franks hot sauce, and ranch. Stir to combine. Once the cream cheese mixture has melted together add in the chicken and jalapeno. Stir to combine. Add in the mozzarella cheese and stir until fully melted. Remove from heat and enjoy as a appetizer dip or as a meal! Note: You can serve it with veggies, flackers and pork rinds for dipping or over cauliflower rice for a meal. Chop the chicken up into large chunks and the asparagus spears into fourths and set aside. Heat a large skillet to medium heat. Add butter to the hot pan and allow it to meal down. Once melted add in the minced garlic and asparagus. Cook for 2-3 minutes until spears have turned bright green, but still have a crunch. Add in the heavy whipping cream, mozzarella and parmesan and stir to combine until fully melted. Add in the paprika, salt and black pepper and combine. Add in the chicken and bacon bits and and stir one last time. Serve immediately and enjoy! Store in a sealed contained in the fridge up to 1 week.